What happens when you need a coffee fix and the barista has no milk? It’s time to improvise. And back in 1946, that’s exactly how Vietnamese egg coffee was introduced to the world. During the French War, there was a serious shortage of milk, and only one man came to the rescue of java junkies across the nation’s capital during a time of need, Nguyen Van Giang. Back then, he was working at the renowned Sofitel Legend Metropole Hotel in Hanoi. After patrons began foaming at the mouth for this unique concoction, he decided it was high time to throw in the towel on the hotel industry and open up his own shop. 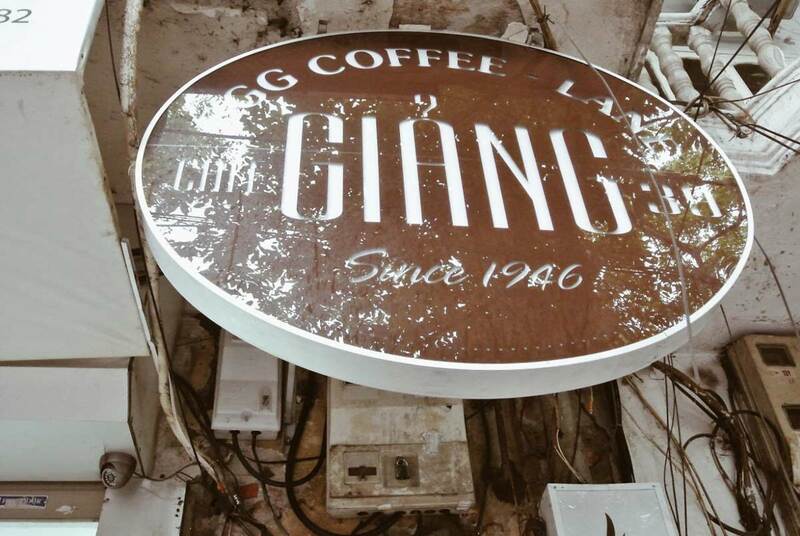 Today, Giang is revered as the original Vietnamese egg coffee king, and his shop, Cafe Giang, is managed by his son, Nguyen Van Do in Hanoi’s Old Quarter. How is it different than normal coffee? We’re in the coffee business ourselves and it’s easy for us to get all geeked out about caffeine. But, to put it simply, the first thing you will notice is not necessarily the taste, but the texture. It is extremely rich and bold. To the point where it must be ingested with a spoon. So, don’t just go sipping away, be patient. Take the time to slowly stir, mixing all the layers together to strike that perfect equilibrium. 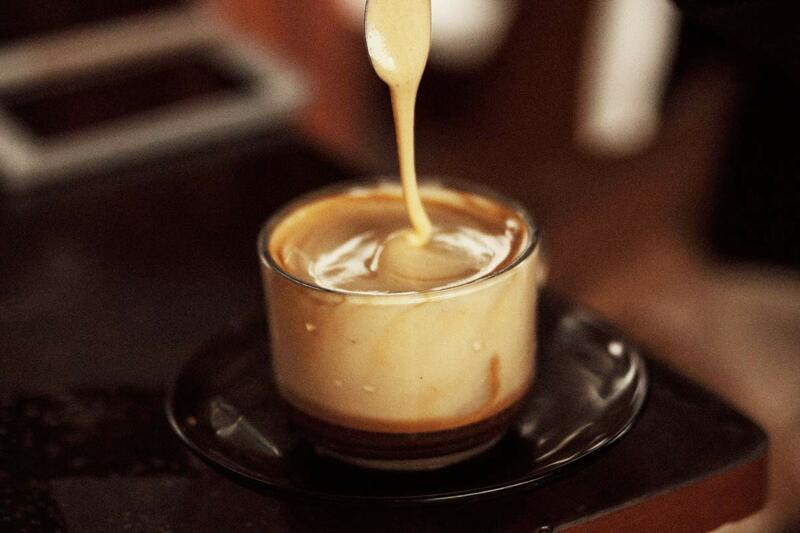 As Vietnamese egg coffee has seen a massive burst in popularity since its initial introduction to consumers, many versions of the original recipe have been altered or replicated in various forms. It can be ordered hot or cold, and both appear to be quite different experiences of paralleled delight. It should also be mentioned that egg is not a dominate taste in the coffee, and surprisingly enough, it’s extremely palatable, although quite sweet and dense for the traditionalist. The cold coffee comes in a cup loaded with ice and tastes more like a dessert. Think ice cream or runny tiramisu. The hot version of Vietnamese egg coffee comes in a smaller cup and has a thick, foamy egg-based head. 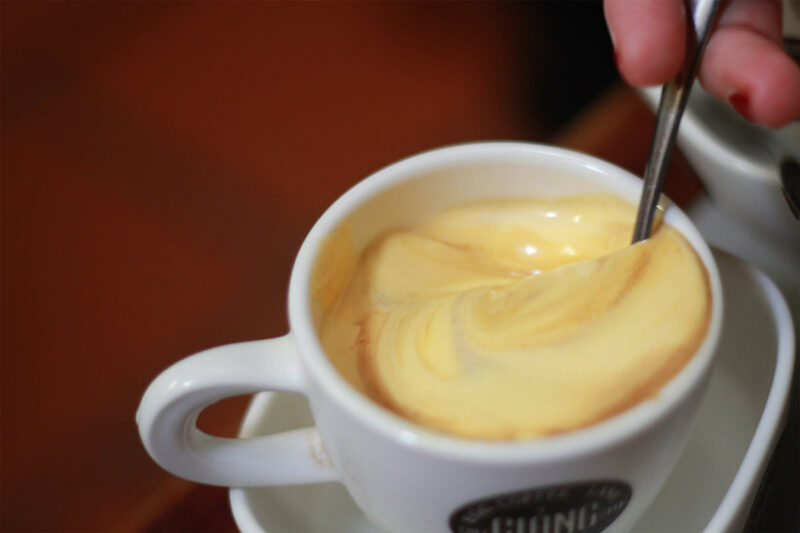 This yellowish heap of jacked-up creamy goodness is perfection, and if you’re a java junkie, most certainly worth a flight across the world in our opinion. It’s a subject of much debate, and there are countless tweaks on the traditional recipe, which have been kept strategically hidden since the 1940s by its inventor Mr. Giang. While some classical renditions call for a slew of ingredients like egg yolk, butter, sugar, condensed milk and even cheese, there are various recipes that keep it much more simple and to the point. The key is, however, to use the egg yolks to complement your brew without adding the actual egg flavor to the coffee. This is easier said than done. As density plays a pivotal role in the success of your Vietnamese egg coffee, the secret lies in your whisk. Overdo it and you’ve lost the wonderfully frothy key component. Underdo it and your guests will be drinking some offbeat assortment of coffee and egg yolk, and we can all agree that sounds horrible. 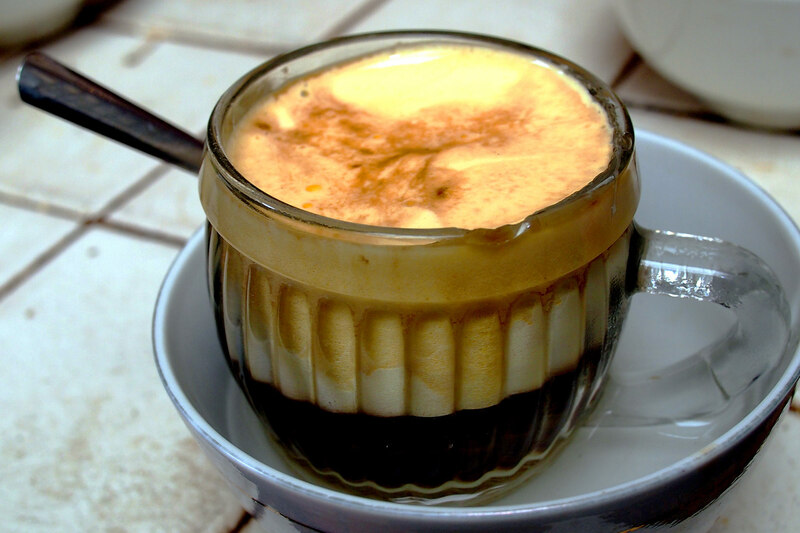 ‘Ca phe trung’ or Vietnamese egg coffee is brewed in a Vietnamese style drip filter, before adding the thoroughly-whisked mixture of the yolk (and other ingredients). After all the components are mixed together, the cup is then put in a bowl of hot water to help the coffee maintain the necessary temperature when it’s served. Although it sounds pretty simple, it’s really easy to mess up, like say, Hollandaise sauce. Each ingredient must be measured with accurate precision, and each brewer may have a different opinion about what is best. Although there is much discussion about how much of each ingredient to use, it’s ultimately up to your palate to make the decision. Although it’s nearly inarguable that the most enviable cup of Vietnamese egg coffee can be had in Hanoi, the frothy beverage has finally began to drip its way down to Vietnam’s southern hub of Ho Chi Minh City. 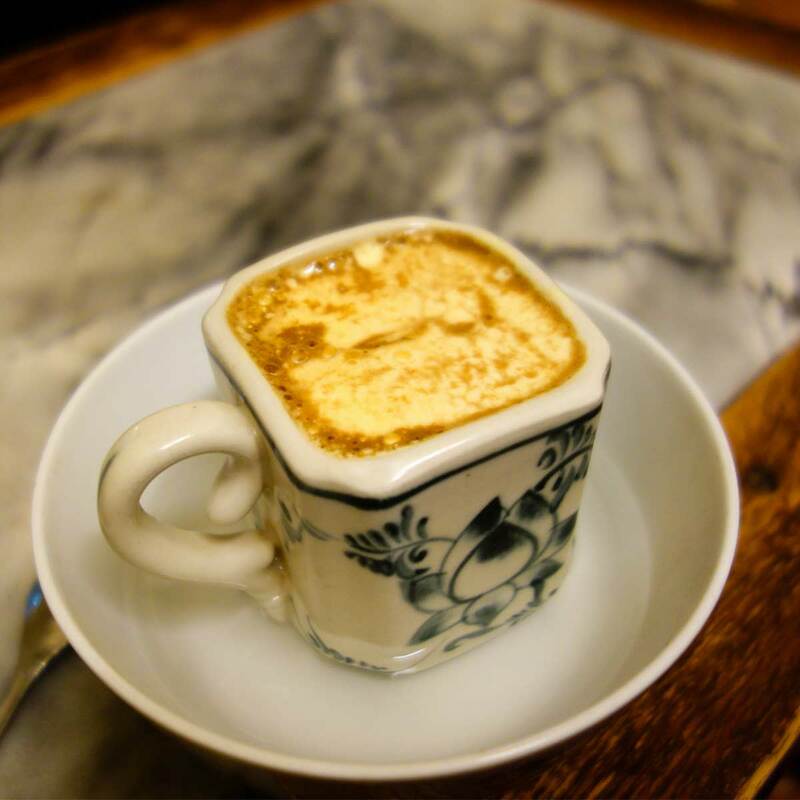 As coffee culture remains an adhesive element of Vietnamese culture and society, the industry is seeing massive growth, and as egg coffee continues to garner international attention, more and more cafes will have a go at whipping up their own version. So, we did some research and compiled a list of some of the best places currently serving Vietnamese egg coffee. We know, and you’re welcome! Cafe Giang: The one and only. The first of its kind. You’ve already been given the run down on this spot, so keep reading. Dinh Coffee: The daughter of the original egg coffee extraordinaire, Nguyen Van Giang has given her brother (owner of Giang Cafe) a run for his money. Yes, the competition is heating up as brother and sister go head to head to see who can make the best egg coffee in Hanoi. You might as well go to both and see who you think does it better. The owner of Ding Coffee, Ms. Bich, has created her own rendition which uses cocoa. Sounds interesting right? Pho Co Coffee: Overlooking Hoan Kiem lake, this is the new kid in town and although by far the most expensive, you can enjoy this cup of Vietnamese egg coffee while taking in their colonial architecture atop a quaint rooftop setting. Hanoi Street Food Tour: If you would like a guided tour to experience some of the best food and beverage options in town, look no more. They can take you to Cafe Giang as well as numerous other hot spots around the city. The Note Coffee: With a sister shop in Hanoi, they should be able to get it right, and judging by the reviews and our recent visit there, it’s pretty on point. Pop into the famous backpacker district of HCMC for a quick taste. Luu Gia Cafe and Food: Situated outside the city center, guests will get a truly Vietnamese experience here. It’s always jam-packed and is situated on a bustling street in Phu Nhuan district.